"know Ye the Truth, for the Truth Shall Set you Free"
MARIJUANA, or MARIHUANA, the Mexican name for a narcotic drug obtained from the leaves of the hemp plant CANNABIS and generally used in cigarettes. Introduced from Mexico about 1910, probably at New Orleans or in the southwestern states, its use has spread at an alarming rate in the United States Known by a variety of local terms, "reefers," "fu," "moocah," "mezz" "muggles," "Mary Warner," "The Weed," it is considered by many authorities to be the most potent drug in common use. Although the effect of marihuana is often unpredictable, and may range from extreme elation to profound melancholy, the result is almost invariably accompanied by a loss of restraint and self-control, with subsequent erratic behavior. Hallucinations of sight and hearing are not uncommon, and delusions of strength may lead to feats of endurance without sense of fatigue. Although the long-run effects of the continued use of the drug are disputed by medical authorities, it is thought by some that chronic addiction leads to a loss of mental ability, stupor, and indolence, and that in such cases irreparable damage is done to brain tissue and nerve centers, and insanity may be the result. Marijuana smoking did not become a problem in the United States until about 25 years ago and has caused serious concern only in the past 12 to 15 years. Its use has spread to all sections of the country, being especially prevalent in large cities. In 1937 it was estimated that there were over 100,000 marijuana addicts in the United States, the majority being of high school and college age. An index of the great increase in the use of marijuana since that year is the number of arrests for violation of narcotic drug laws, which more than doubled between 1937 and 1950. HEMP: an annual bushy plant belonging to the Nettle family, Urticaceae. These plants have racemes of green flowers, toothed leaves, and a rough, hollow stem. They are native to central and western Asia and are cultivated extensively in both temperate and cultivated extensively in both temperate and tropical regions. Hemp, Cannabis sativa, thrives best in humid climates having rich, humus soils. Uses. Hemp is grown for its seeds and fibers and for the drugs obtained from its flowering tops and leaves. The seeds contain an oil used in soaps, paints, and as a substitute for linseed oil; the narcotic drug, Cannabis, obtained from the leaves and dried tops, is used in relieving pain and in the treatment of nervous disorders. Hashish and marihuana, powerful narcotic drugs, are prepared from resinous substances also obtained from the leaves and flowers. 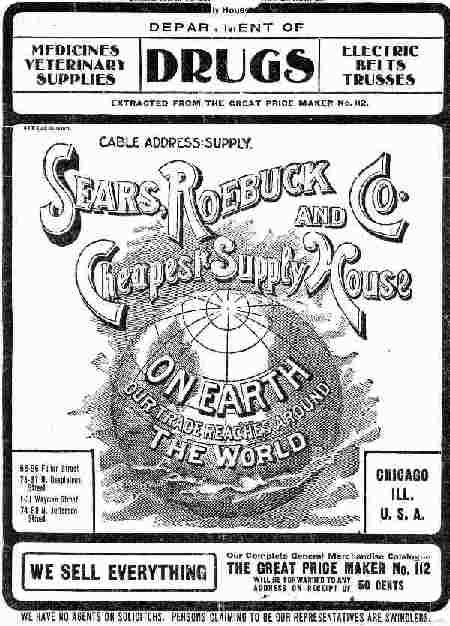 As an aside, it is interesting to note that SEAR'S ROEBUCK & Co., just a few years prior to this, (as the 1901 Catalog shows) actively SOLD Medical Cannabis products through it's mail order service.